Plans for the 2014 Montol celebrations here in Penzance are well underway. This year it is being run by the Cornish Culture Association who have organised a fantastic and packed programme of events on Sunday 21st December. The concept of an organised community celebration on one day called Montol is a modern one. However, many of the individual elements held on the day are much more ancient ones, practised in Penzance and across West Penwith during the height of winter. Guise Dancing, the Chalking of the Mock, fire and beacons, and the revels of the Corn-Market are all well documented midwinter traditions. 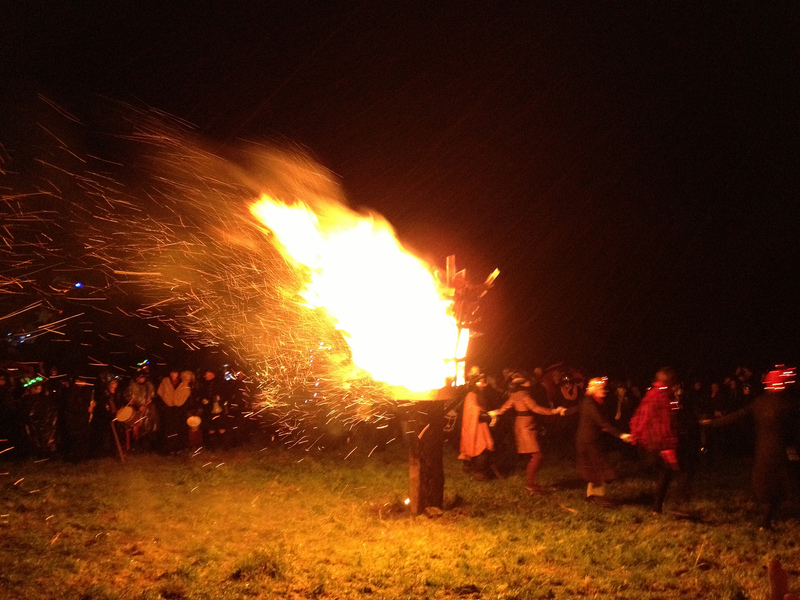 Today’s Montol has become a tradition in its own right – an event that many in Penzance look forward to and expect to happen. In the times when our part of the world is at its darkest comes a time when fire, costume, music, colour, dancing, stories, and a little revelry lift the dark blanket of winter a little. Of course, traditions don’t always have to stand still. Last year’s experimental revival of the Corn-Market is a form of guise dancing formed as a series of games and parade between the town’s pubs recorded by William Sandys in the early 19th century. It is now known as the Corn Market Revels and has proven to be so successful that this year it has inspired a series of ‘guilds’ who are attaching themselves to other iconic buildings in Penzance. Look out for the Egyptians emerging from the Egyptian House on Chapel Street, and the Turks from the Turk’s Head pub (Penzance’s oldest pub) during the course of the evening. Something that I have learned this past year is that guise dancing is a fascinating tradition. Archaically referred to as “goosey dancing”, it is not, in the strictest sense, necessarily always a dance, but a form of performance that can take many forms. Traditional costume can be rather sinister in its appearance. If you are interested, do have a look at Simon Reed’s Guise Guide to find out more. Lovely photos, plus an interesting and engaging essay. Thanks!